When you think of the best flooring company what do you expect from them? The best quality flooring for the price. For carpeting that means the highest quality in terms of the type of carpet you want such as a pet protect or wool carpeting.. For Luxury vinyl tile you are going to want a waterproof LVT that is built to last for a long time and not fade. Most people do not know this but having an LVT with built in padding or having some sort of underlayment will make it softer to stand on which is important if you spend hours in the kitchen. The best carpet installation means that the installation is guaranteed for life and that your carpet looks beautiful in every room. Very few companies offer this as they typically use subcontractors and unless you do not like something and bring it up when the job is done you are out of luck. The bottom line is that the life of the carpet will suffer and it will not look as good as it should if it was installed by professionals. The best price on your flooring is a combination of these factors as you may be able to get a cheaper price on the carpet one place and the installation cheaper somewhere else. For example, the big box stores often advertise free installation on carpeting but they do not tell you that you are getting the cheapest padding available. When you do an upgrade on the padding it is often double the price of what most carpet companies charge. That’s how they can offer free installation as we all know nothing is free. At Coventry Carpets and Flooring we build upon your dreams and provide you the best flooring and the nicest looking rooms for your home. We will come out to your house with our mobile showroom or you can come into our showroom, with an appointment, to get ideas for your flooring installation project. Our design consultants have extensive knowledge and can help guide you through the different types of flooring options and the pros and cons of them in specific rooms in your home. We are one of very few flooring companies in Denver that actually do their own installations for carpeting and luxury vinyl tile. In fact, most other retailers sub out their work and you may never see that installer again. 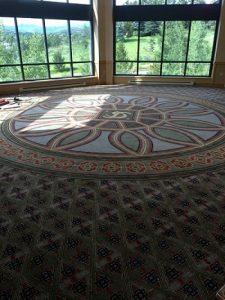 We are one of the only companies in Denver that guarantee’s the installation for the life of the carpet because we install it. When you compare the same carpeting, padding and installation price that Coventry provides you against any of our competitors you will find that we are about 20 to 30% less overall and your installation is guaranteed for life! That is why Coventry is the best flooring company in Denver. At Coventry Carpets, we don’t just want to sell you carpet one time, we want to provide you this service as long as you are in Denver. We look forward to servicing you and your family for years to come, that’s why 90% of our business is word of mouth referrals. Be sure and see what others are saying about Coventry Flooring by going to the following links. Ask around to friends, family, neighbors, online to see what company is right for you. I think you will find out soon enough that Coventry Carpets is the name that keeps popping up. Luxury Vinyl Flooring is the fastest-growing type of flooring. The term “Luxury Vinyl” came about to describe a vinyl tile or plank floor as one that looks like wood or stone. Luxury vinyl plank (LVP) is a wood-like plank. ( LVT) stands for Luxury Vinyl Tile and it looks like tile or natural stone. Technology has developed these looks to the point where it is difficult to tell if you are looking at a luxury vinyl plank floor or the real thing. Luxury vinyl has a slightly softer surface than wood or tile floors. This surface provides more flexibility making it easier to stand on for long periods of time which is great for kitchens or game rooms. In addition most luxury vinyl is waterproof. Deciding on planks or tiles? Wood planks provides a warm feel, and is good for family rooms, dining rooms, kitchens, and bedrooms. Tile or stone tile works well in bathrooms, entryways, and laundry rooms. Planks can be put down in staggered or random patterns, or diagonals. You can lay tiles in any fashion such as point-to-point or brick patterns. You can even use grout between luxury vinyl tiles to make the appearance or real tile. Another option to consider is what size you want your luxury vinyl flooring plank or tile to be. Tiles are square or rectangular. Planks are rectangular and come in different length and width. Click-to-lock: The luxury vinyl flooring float above the subfloor with this installation method. Click-to-lock flooring has grooves and tongues on its edges to allow for easy interlocking. You can walk on this installation as soon as you finish. Glue-down: An adhesive is used to attach the flooring to the subfloor, grout can also be used for a tile look. Loose lay: Has an anti-slip layer on the bottom of the flooring to help it stay in place on the subfloor. Installation is mess-free, and it can be easily removed and replaced. With vinyl flooring you can save thousands without sacrificing style because the look is so realistic on the nicer luxury vinyl. LVP is less expensive than tile or wood and the installation costs and time are significantly less as well. Beware of bargain brands. They can scratch easily and may not be waterproof. You get what you pay for. Nicer vinyl flooring usually has some sort of rubber underlayment which makes it softer to walk on. During installation you can put some sort of underlayment to make the floor feel even softer and quieter, and provide additional insulation. 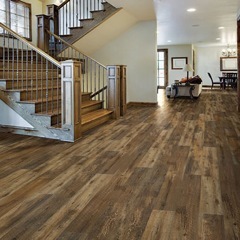 Unlike wood vinyl flooring is great in bathrooms, basements and kitchens because it is water proof or water resistant. It will not discolor or rot and the floating variety is great for basements that could potentially flood. Vinyl flooring is perfect in busy households. It won’t scratch easily. Better vinyl flooring has through-body coloring. Which means if they scratch the damage is less visible. Vinyl feels soft underfoot. Vinyl absorbs pressure so it is nice to walk on. For additional comfort, treat yourself to planks that feature added layers of padding or use an underlayment between the sub floor and the vinyl. Vinyl flooring stays room temperature. In cold environments your floors will feel warm and comfortable. Vinyl flooring also absorbs noise so it is a great choice for second stories and playrooms. It does not get any easier than vinyl flooring. They clean-up in a matter of minutes with a static dust broom or mop. At Coventry we carry the following brands of Luxury Vinyl: Provenza, Du Chateau, Earthwerks, Evoke, Armstrong, Stainmaster and others. Coventry is the home of the lifetime installation guarantee! If you are looking for exceptional customer service and the best deals on flooring give us a call to schedule a meeting at our Denver showroom located close to 8th avenue and I-25 or for an in home estimate with our mobile showroom. We will be able to give you a cost for the installation after examining the areas you want your LVT or carpet installed.